The Charger boys limit the Warriors’ chances in the 2-0 shutout. If Shorecrest was going to advance to Wednesday’s Class A region final, it needed to beat district rival Calvary Christian for a third time and a second time in eight days. The Chargers dominated play and scored a goal in each half to defeat the Warriors 2-0 Saturday night. “This game was similar (to the other two) but I think they had a lot more chances in the other games," Shorecrest coach Jason Montoya said. “(Calvary Christian) is a very good team and they work their butts off." The Chargers (17-3-1) controlled possession in the first half. After five shots and a few near misses, they finally found the net in the 29th minute. Turner Bramlet '20 took a free kick and sent it to Samuel Idinge '20, who was unmarked at the top of the box. He redirected a right-footer that grounded into the left corner. “I didn’t know if I had time or not so I just hit it,” Idinge said. “I pretty much thought it was going in. I placed it pretty well." Two minutes later, Shorecrest’s Cole Savitsky '19 hit a hard shot from 15 yards that was saved. The Chargers outshot the Warriors 8-1 in the first half. It was more of the same in the second half. Calvary Christian (10-6-2) got off a shot on goal in the first minute but didn’t have many serious chances after that. Shorecrest had several and converted again in the 56th minute. The Warriors tried to clear a ball back to goalkeeper Athen Slavkin, but he was beaten to the ball by Charger Asher Rovin '20. Rovin got off a left-footer that trickled just inside the right post for a 2-0 lead. “I read the play and went to cut it off," Rovin said. “I just had to get to the ball. I was a little worried when I hit it but it turned out well." Calvary Christian had a chance with 12 minutes to play. Austin Marshick had a free kick from just outside the 18-yard box, but the shot was saved and cleared. Shorecrest was able to keep the ball away from its goal after that and close out the game. 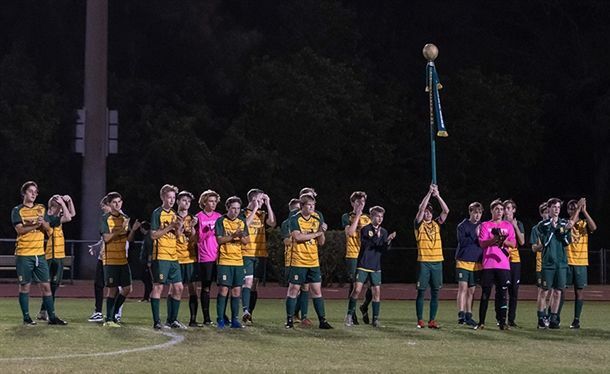 The Chargers move on to compete in BOYS SOCCER REGIONAL FINALS on Wednesday, February 13, at 7pm vs Canterbury Fort Myers at Canterbury Fort Myers. Photo by Shorecrest parent Jennifer Stenger.